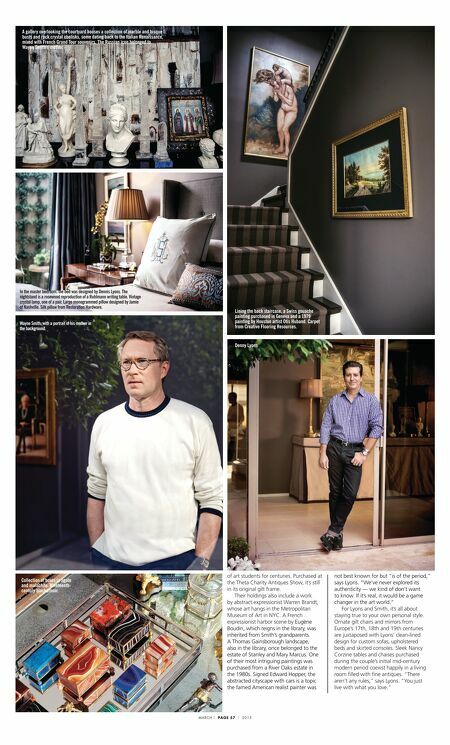 Clockwise from near right: In the master bedroom, the gold-leaf hand table was custom-made by Mexico artist Pedro Friedeberg for Smith and Lyons' home in San Miguel. Wing chair custom-covered by Shabby Slips in woven cashmere. The central courtyard was landscaped by Randy Fajkus. Pair of woven resin ottomans from Restoration Hardware, with Sunbrella cushions. Travertine table purchased from the estate of Baron di Portanova. The bronze sculpture is an 18th-century Italian fountainhead. 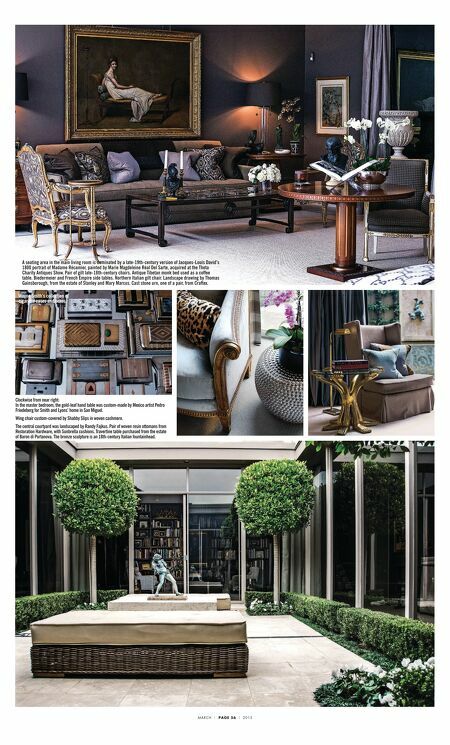 MARCH | PAGE 56 | 2015 A seating area in the main living room is dominated by a late-19th-century version of Jacques-Louis David's 1800 portrait of Madame Récamier, painted by Marie Magdeleine Réal Del Sarte, acquired at the Theta Charity Antiques Show. Pair of gilt late-18th-century chairs. Antique Tibetan monk bed used as a coffee table. Biedermeier and French Empire side tables. Northern Italian gilt chair. Landscape drawing by Thomas Gainsborough, from the estate of Stanley and Mary Marcus. Cast stone urn, one of a pair, from Craftex. Wayne Smith's collection of cigarette cases and boxes.